For those of you who are just tuning in: my friend Stacia and I have had a theme for each year since 2007. They started as dating-related themes (Say Yes in 2007, followed by Go With Your Gut in ’08***) but I’ve found myself applying them to other aspects of life. I said yes to a lot of things in 2007 that weren’t dates, and most of them were good. Others were 2010: Quality Over Quantity; Hit Me With Your Best Shot, 2011; Be Kind, 2012, Be Kind; and Explore the Possibilities in 2013. We can’t remember 2009’s theme, but it was a doozy and we were successful at it so that’s all that matters. 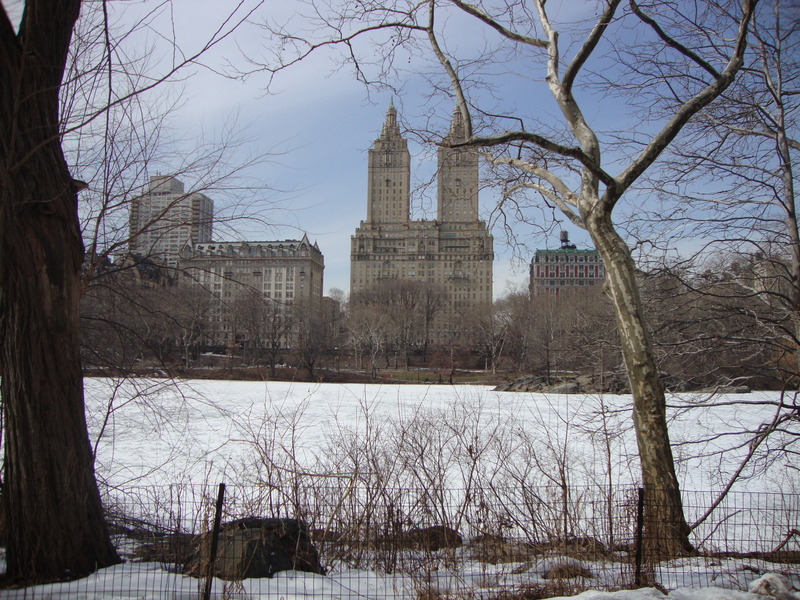 It’s a new year (NY), so I have to have a photo of New York (NY). 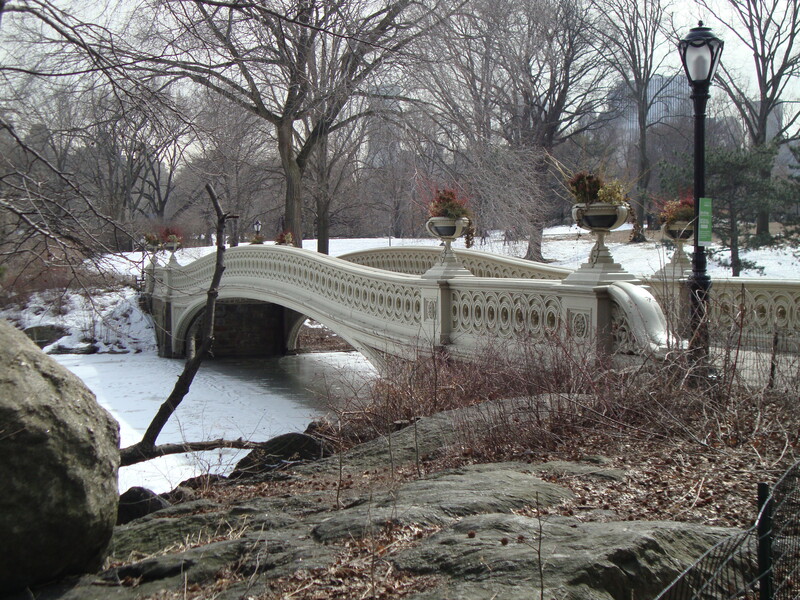 This is the Bow Bridge in Central Park. It is not usually this empty. Last year’s theme was “2014: Live Here Now,” which was about accepting and embracing who you are and where you are in life, both geographically and emotionally. It was about loving the one you’re with, in a sense, and being in the moment, even though the future might look very different. It was a good theme; I probably didn’t adhere to it all the time, but I’m almost a year into my job, and that’s one area where I feel like I dove in, committed, and made it my own. Same with writing and my local writing community. This year I was kicking around a few themes: “2015: I Give Up,” “2015: Living Between,” “2015: Selectively Seeking,” and 2015: Complete or Delete.” They’re similar in a lot of ways and can be flexible to fit a lot of aspects of life. Living Between references my feeling that I’m not quite where I want to be with a lot of things (lovelife, writing, living situation, etc.) but I’m close, and I feel like these things are going to fall into place soon. Living Between sees this as a year to transition and make them happen, help them fall into place. Like a gap year, or a bridge, living between is going from one place in life to another. And “2015: Living Between” has a nice ring to it. Selectively Seeking is similar but fits a little more with the dating aspect much like our previous themes. It’s about being open to possibilities but also selective in what we choose. Seeking certain things (different living situation, writing opportunities, improv options, adventure/travel, dates) but choosing them carefully. Not saying yes to everything, but also seeking out “yes” opportunities and not just waiting for them to happen. Complete or Delete relates to a number of unfinished projects I have and how I’m determined to finish them or get rid of them. It’s about cleaning house, and it works for a lot of things (stuff in my apartment, clothes I never wear, food past the expiration date) but also writing projects, photos, work stuff. It also applies to dating, especially if I go back online: if they’re not complete (as a person, not profile-wise), I must delete. I’m tired of meeting half-formed or uninteresting people, people who need someone else to complete them or who are hung up on past relationships. Plus it rhymes! I Give Up kind of speaks for itself (and is certainly the funniest, especially with respect to dating) but it’s about letting go/giving up on/getting rid of things. Letting go of wanting to meet someone and instead focusing on enjoying the people I already know. I Give Up trying to be perfect and instead will try to do the best I can in the projects and pursuits I choose. Letting go of stuff (things/food/ideas/habits) that I’m not using or that aren’t good for me. I didn’t want to use “Letting Go” or “Let it Go” for obvious reasons****, but that’s the basic idea. I sent my theme ideas to Stacia (we’ve kind of taken turns on the brainstorming) to get her thoughts on this year. Stacia is currently in her second year working as a school counselor in Venezuela after two years in Thailand, so she was drawn to these themes for similar (but different) reasons. She narrowed the choices down to two “Living Between” and “I Give Up,” both of which seem to fit her life situation. She also suggested “The Year to Find Warmth” as a joke, but that only applies to half****** the year, so it doesn’t work as well. The one we’re going with is (drumroll): “2015: Living Between.” It seems to cover much of what the others do but acknowledges the transition time. I like the idea of “I give up” because it’s giving up on what we thought things should really be and accepting what they are or will be instead. Also “Living Between” is good because of my adjustments and settling back into life in the USA. I’m already feeling torn between the international and stateside lifestyles. I want some of both. It’s true that most of our themes have been dating specific but maybe that’s exactly what isn’t working. Maybe we need to focus more on things other than dating and other things will fall into place? This was one of the first sights I took in when I first visited New York. It’s a new year, full of new opportunities for first sights. I hope to take advantage of them. I hope you do, too. The year is new, but the theme feels older or maybe younger than some of the others. I feel odd being this age and in a “transition” period, but I feel young in the same sense, too. I’m excited to see what the new year brings. I hope your year, whatever the theme, is a good one. *Remember that book There’s a Monster at the End of This Book ? ** It’s like that but not like that. ***Which applied to a lot of things that year. Like voting. Go With Your Gut was definitely a reaction to Say Yes in 2007. *****Not that I think she should apologize for her performance. I think Kristen Anderson-Lopez and Robert Lopez should apologize for writing it so difficult to sing. But I’m only half-serious on that. ******Okay, 2/3 to 3/4 depending on where you live. Oh Sarah, I have always loved your themes – and your blog! I’m so glad, Tara! The themes definitely make the year interesting. Oh that is so true–although, I feel like “let it go” and “give up” are slightly different directives. One is a “water off a duck’s back” mentality; the other feels more hopeless. I’m glad you didn’t go with I Give Up. You have so much going for you! With your recent publishing successes, it seems like your star is just beginning to rise. You might be living between obscurity and fame. Thanks, Laura! I hope you’re right, since I’m sending out query letters soon.